The Miyuki slide end tube is for use with loom or square stitch bracelet projects made with cylinder beads size 11 (Delica beads) and size 1.8mm (Aiko and Treasures). 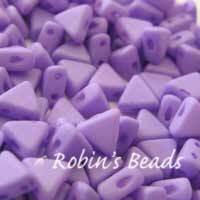 It can be used with loom or square stitch pieces. To attach the clasp to your piece close one tab on the tube with chain nose pliers then carefully slide the end of the woven piece down into the tube. When the piece is completely inside the tube, use chain nose pliers to close the other end tab on the tube.